i can't wait for fall. i love everything about it. we've already starting talking about what halloween costume i'll be making for alex and i'm already thinking about the stylish "costumes" fall brings into my wardrobe. i wrote about the jcrew blogger event that i attended here. at that event i had my eye on several of the trends for fall including polka dots (check!) & chambray. i spotted this adorable denim shirtdress that i thought would be a nice addition to my wardrobe for the cooler months ahead. that is if there are any cooler months ahead... i can see this going great with flats or boots and would easily carry over into winter with tights. but that price is all wrong. now that's more like it. the same look for less. check out the jcrew factory store now open seven days a week online. 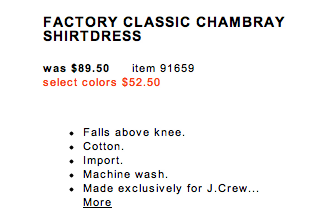 love the new jcrew jules dress in snowcat? who doesn't? check out the similar option my friends over at edit found for a fraction of the price! looking for an easy way to incorporate the polka dot trend this fall? check out these adorable bags at hansel from basel. I love the Factory dress and its price much better! I'm already picturing all the great ways I could wear this adorable dress, and I haven't even bought it (yet...)!